JERUSALEM - Israel stepped up its offensive on the Hamas-run Gaza Strip on Wednesday, pummeling scores of targets and killing at least 22 people as Israeli leaders signaled a weeks-long ground invasion could be quickly approaching. The military said it struck about 200 Hamas targets on the second day of its offensive, which it says is needed to end incessant rocket attacks out of Gaza. Militants, however, continued to fire rocket salvos deep into Israeli territory, and Israel mobilized thousands of forces along the Gaza border ahead of a possible ground operation. "The army is ready for all possibilities," Prime Minister Benjamin Netanyahu said after holding a meeting of his Security Cabinet. "Hamas will pay a heavy price for firing toward Israeli citizens. The security of Israel's citizens comes first. The operation will expand and continue until the fire toward our towns stops and quiet returns." The fighting stepped up as Egypt, which often serves as a mediator between Israel and the Palestinians, said it was in contact with both sides to end the violence. It was the first indication since the offensive was launched on Tuesday that cease-fire efforts might be under way. Arab nations called Tuesday for an emergency meeting of the U.N. Security Council and immediate action to end what they say is Israel's "outrageous onslaught" against Palestinians, especially in Gaza. Palestinian U.N. envoy Riyad Mansour and ambassadors representing Arab, Islamic and non-aligned nations told reporters after meeting the council president that they expect a meeting to be held very soon. 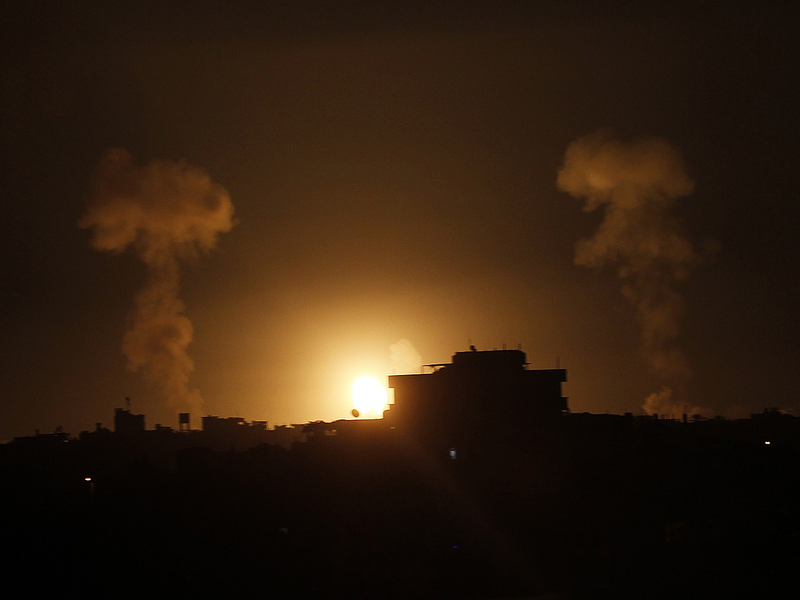 The offensive has set off the heaviest fighting between Israel and the Islamic militant group Hamas since an eight-day battle in November 2012. As the death toll continued to rise, Palestinian President Mahmoud Abbas accused Israel of committing "genocide." Israeli leaders warned a ground invasion could be imminent. "Despite the fact it will be hard, complicated and costly, we will have to take over Gaza temporarily, for a few weeks, to cut off the strengthening of this terror army," Yuval Steinitz, Israel's intelligence minister, told Israel Radio. "If you ask my humble opinion, a significant operation like this is approaching." The government has authorized the army to activate up to 40,000 reservists for a ground operation. An Israeli government official, speaking on condition of anonymity because he was discussing Israeli tactical strategy, said the reservists would be sent to the West Bank to allow active duty troops to amass near the Gaza border. Despite the tough threats, Israeli security officials are still hesitant about ordering a ground invasion due to the many risks. Entering Gaza could lead to heavy civilian casualties on the Palestinian side while putting Israeli ground forces in danger. It remains unclear whether the international community would support such an operation, or how Israel would end it. Officials have little desire to retake control of Gaza, a densely populated territory of 1.8 million people from which Israel withdrew in 2005. Since the offensive began Tuesday, Israel has attacked at least 560 sites in Gaza, the military said. Militants have fired more than 160 rockets at Israel, reaching further north than ever before. Palestinian medics say a total of 49 people have been killed in Gaza, including 22 on Wednesday. Of the total dead, medical officials have confirmed at least 15 are civilians and 10 militants, with the remainder uncertain. The rocket fire from Gaza has not caused any serious Israeli casualties. CBS News' Holly Williams reports Palestinian officials say the number of civilians killed in the strikes is climbing. One health worker said 25 civilians died on Tuesday, including some children. The Israeli onslaught has caused panic in Gaza. A number of airstrikes aimed at wanted militants have also killed family members and bystanders. Many residents have huddled indoors or moved from hard-hit areas to relatives in areas that are believed to be safer. Gaza health official Ashraf al-Qidra said that an 80-year-old woman was among those killed Wednesday. Hamas official Musheer al-Masri said Israel had "crossed all the red lines" and warned that Hamas would strike back fiercely. "What the resistance showed today is only part of what it is capable of," he said. The increasing range of the rockets from Gaza has disrupted life across a wide swath of southern and central Israel, where people have been forced to remain close to home and kindergartens and summer camps have been forced to close. Besides firing toward Israel's two largest population centers in Tel Aviv and Jerusalem, Hamas also fired one rocket that reached the northern Israeli city of Hadera for the first time, effectively putting the entire country under rocket range from the north and south. The city is more than 60 miles from Gaza and was struck in 2006 by missiles from Hezbollah guerrillas in Lebanon. "We got it from both directions," said Maayan From, a 25-year-old Hadera resident. "Our enemies have developed and it is getting scary. We have to put an end to this." On Wednesday, Hamas rockets reached even further north than Hadera. "It's still hard to digest that we are within their range. It changed the way you think," said Ina Marchovsky, 43. "We are full of hope that was the first and last rocket we will see. But I don't know." Egyptian President Abdel-Fattah el-Sissi spoke to the Palestinian president, Abbas, on Tuesday evening to review the latest developments, according to el-Sissi's office. Abbas, who has minimal influence in Gaza, has appealed to Israel to halt its offensive. "Egypt has made extensive contacts with all active and concerned parties to spare the Palestinian people the scourge of Israeli military operations," el-Sissi's office said. It was not clear whether the contacts included formal efforts to reach a cease-fire, or whether Egypt was speaking to Hamas. The new Egyptian government has poor relations with Hamas. In Ramallah, Abbas condemned the Israeli offensive, accusing Israel of committing "genocide" due to the mounting civilian death toll and said it raised questions about Israel's commitment to peace. "Do these actions indicate that we should live with two states?" he said.